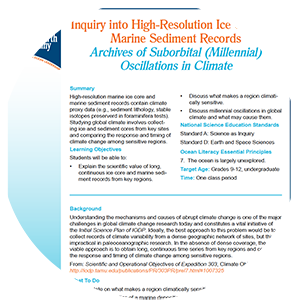 Actvity Summary: High-resolution marine ice core and marine sediment records contain climate proxy data (e.g., sediment lithology, stable isotopes preserverd in foraminifera tests). Studying global climate involves collecting ice and sediment cores from key sites and comparing the response and timing of climate change among sensitive regions. Milankovitch cycles are driven by Earth’s natural orbital oscillations, which in uence the amount of incoming solar radiation (insolation) received. Periodic oscillations in insolation affect temperature and precipitation patterns, particularly in the high latitudes. Changes in insolation at the high latitudes are the principle driver of glacial cycles over the past several million years. These oscillations are manifest in many different types of climate proxy data including lithology, sediment grain size, sediment color, magnetic susceptibility, gamma ray, stable isotopes, etc. Milankovitch cycles are pervasive through the geologic record.